When I visited Lebanon a few years ago for the first time, I went with what I thought was a very open mind about all that I would see and experience. When it came down to it, though, I believed my sense for Lebanese ingredients and flavors had to be broad enough that there might not be many surprises. It’s true that the apricots, the pistachios, the flower waters and spices were there front and center. But on that first glorious afternoon eating a feast at Mir Amin Palace, I scanned a corner display of the mouneh, the preserves and syrups. Apricot: check. Rose: check. Orange: check. Mulberry: wait, what? I asked around about the flavor of the mulberry, and my mom chimed in about how mulberries grew in the backyard of her childhood in Ohio. It seems that yard was nothing short of an Eden, dotted as it was with quince and pears, raspberries and rhubarb and apples. And of course, mulberries. Alice, her mother, made mulberry jam (soon to be available again at Maureen Abood Market…promise). I opened the bottle of mulberry syrup right then and there, saying aloud to anyone within earshot that I’d be paying for it in just a minute. I dipped my pinkie in and tasted a flavor that was the very definition of jammy. Berry, yes, but dark berry, like my beloved blackberry whose depth of flavor I have always loved but whose seeds, not so much. I bought a couple more bottles for the road, hoping they’d make the trip home without breaking. They did survive (unlike the Arak; that was bad news), and it took some willpower not to use them up quickly back home. Once they were gone, they were gone, and I knew that would be it since I’ve never seen mulberry anything here in the U.S. So when we launched Maureen Abood Market and I started getting better acquainted with my favorite Lebanese jams and flower waters from MyMoune, they sent some Mulberry Syrup along with the jam for us to try. Reunited with my mulberry syrup, I knew (hoped, believed!) you would love it as much as I do…. 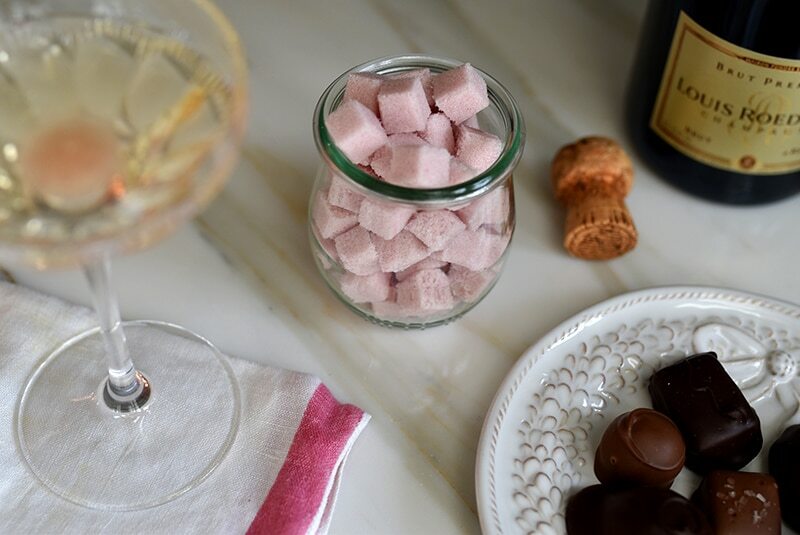 I use little cubette mini-ice cube trays because it takes just one small cube of sweet to dress up your champagne. Make the cubes with a cup of superfine sugar (blast granulated sugar in the processor) and a couple of tablespoons of mulberry syrup. Rub the sugar and syrup with the tips of your fingers until well blended. Press the mixture into the molds. Microwave at half-power for about 30 seconds, then let air-dry for at least an hour before taking the cubes out as you would ice: twist the mold and/or bang it on the counter. Store the cubes in an airtight jar, and drop one into your champagne for Valentine, or anytime, joy. 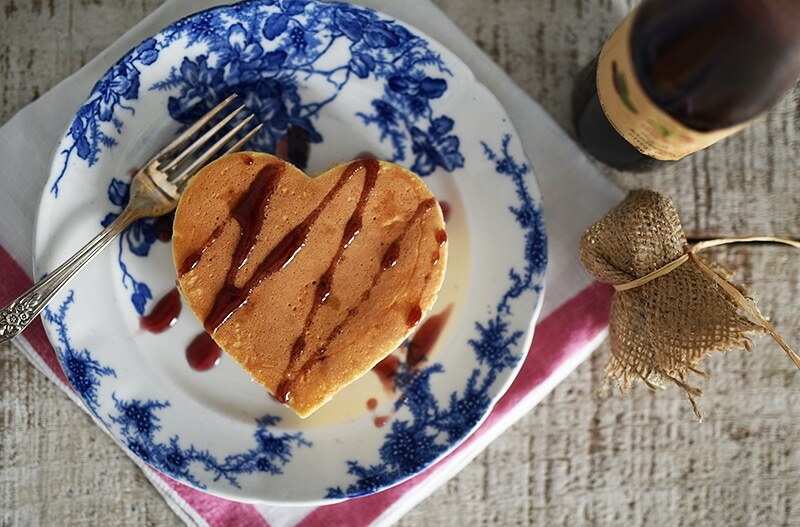 Use your favorite pancake recipe, heart-shaped for some drama never hurts. Drizzle the syrup over top. Both you, your pancakes, and your sweethearts will fall in love. 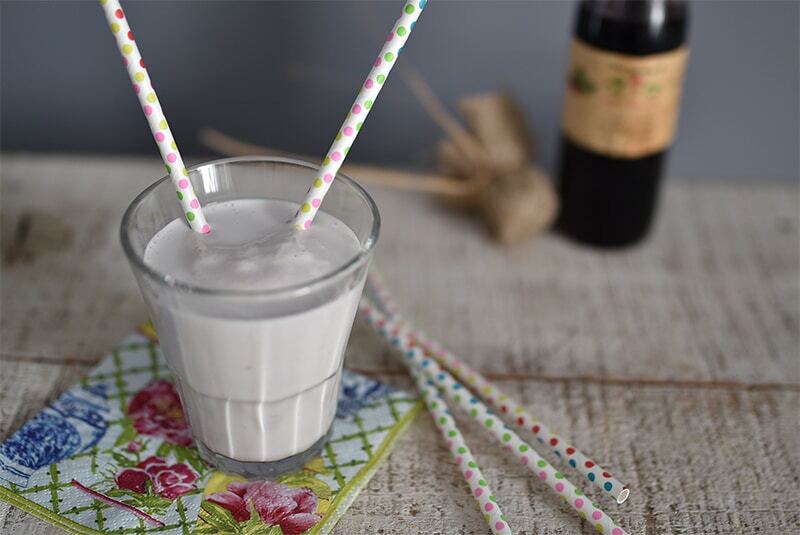 I have a thing for milkshakes and Valentine’s Day, and they just got a shot in the arm with mulberry syrup. Vanilla or strawberry ice cream, a hefty pour of mulberry syrup, blend until smooth. One glass, two straws, lots of smiles. 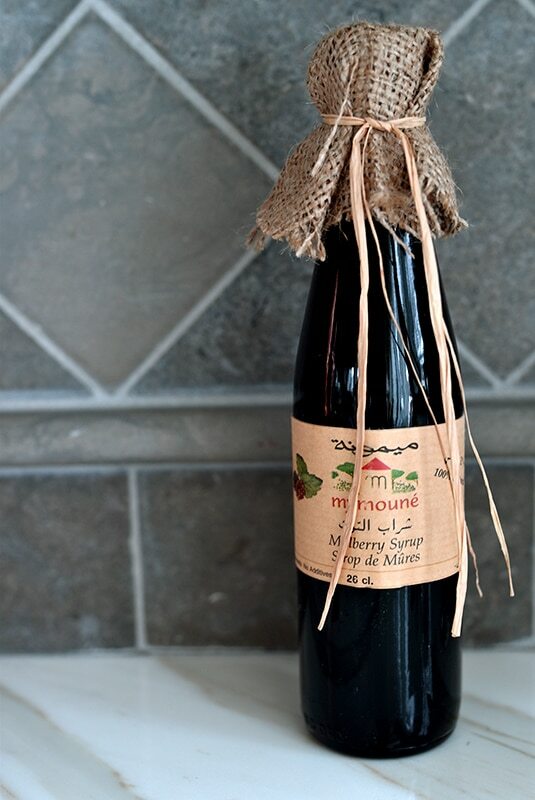 Ready for your own delicious bottle of Mulberry goodness? Get it here, at Maureen Abood Market! 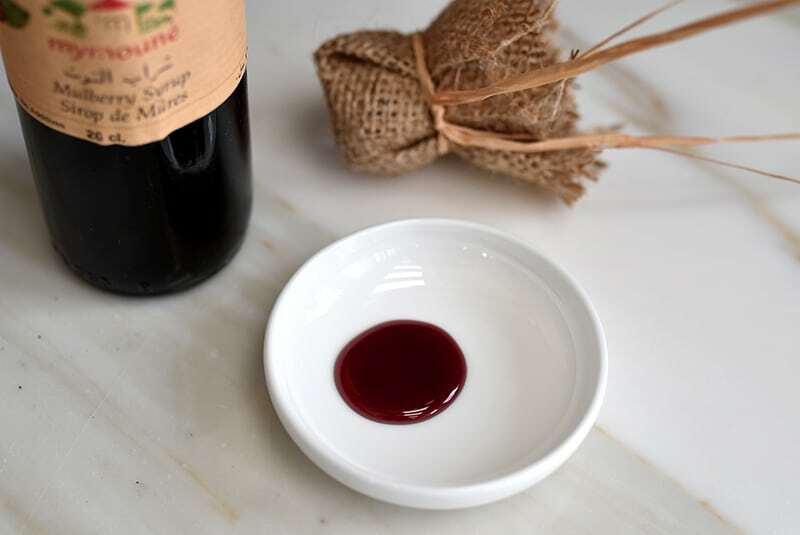 15 Responses to "Lebanese Mulberry Syrup, 3 ways"
Great to hear you speak about Mulberries. I live in Cyprus,and have fond memories of going to picking them on a hazy azure mediteranean day,in the countryside with my father,as a gift for Mama.His eyes would light up upon seeing them,and choosing the plumpest,would hand them over to her,as a gift of the gods…. These are special indeed,the most incredible mauve hue ,longish in shape,glistening ,with an aroma so delicate,it’s perfume permeating your mouth,filling it with loveliness .There is also the creamy white Mulberry,even more prized. My father is now gone,but I planted a tree in my garden,and every year, I pluck the first ones and present them to my mother,with the knowledge of the love ,nostalgia they bare.If on the rare occasion ,there are some left!! an oncoming war with the Sparrows,I make jam,or maybe a coulis,or freeze them.Just as a note of interest.The past generation of grandmothers in the countryside,would produce their own silk,by feeding their silkworms, on the delicate Mulberry leaves,from which cocoons would magically metamorphosize ,there upon,after a complicated method,weaving into silk thread,and producing masterpieces of needlecraft…I have inherited some of these..beautiful raw silk curtains,delicately embroidered pillowcase,my grandmothers.My mothers appliqué embroidery also,past down to me,and then from me ,to my girls and son,cherished,always,as a memory of love. How special Mairi. Thanks so much. We had a big Mulberry tree on our property in FLA when I was growing up. It was for climbing not eating they kept telling us we would get worms but we could not resist and, of course, our purple mouths always gave us away. What a wonderful walk down memory lane you have given me. Maureen, I believe the multitude of mulberry bushes remains from what was a thriving silk industry in the Levant before the invention of nylon. Silkworms feed on mulberry leaves. My Grandparents had a large farm on the Republican River in Nebraska. It was covered with wild foods. Lots of wild mulberries. We would take an old sheet and the adults would hold it under a tree and us kids would climb the tree and shake like crazy. The berries would fall into the sheet. Then on to another tree. Mom would spend hours sorting the berries then hours making jelly and syrups. Her hands were stained for over a week but I think it was a stain of pride. The friends were rather jealous that we had the fruit available. —-I have a mulberry tree but don’t have the help in gathering the fruit so usually just grab a handful and pour them in my mouth each time I pass. Might try to gather more next year now that you reminded me of the treats available. When I was young and it was summertime, we used to ride our bikes before breakfast to a huge mulberry tree on a deserted lot, climb up into its branches and pick as many mulberries as we could. Then we would bike home and eat the berries with cereal and milk and sugar, and experience the triumphant feeling of self-sufficiency. I’ve never understood why mulberry trees are considered a weed. Delicious! or not .. juice running down fingers and clothing all covered with juice. now the seeds i would not care for so much but the rest of it sounds divine. We live in Lansing and there’s a mulberry tree that hangs over our yard from a neighbor’s yard and they fall into our yard. I collected a bunch one time a few years back to make jam, but when we tasted the berries, they were surprisingly tasteless, so we didn’t end up doing that. Maybe it was a bad year for mulberries. I haven’t collected any since. I was just thinking about that and realized that I haven’t noticed them on the ground like usual. Either the new people who bought the house cut down the tree or our ‘puppy’ has been eating them. She’ll be two this spring and I’ve seen her pulling raspberries off bushes, so it’s entirely possible she’s been eating them off the ground. Lucky puppy! Thank you Lisa–I’m glad to know there are mulberry trees in Lansing! When I was in Cairo last year, I met up with a young chef who gave me a huge jar of mulberry jam she had made, flavored with cardamom. It’s a pity mulberries aren’t appreciated as much in the US, because that jar was an incredible treat. I would like to purchase Charab El toot where do I get it ???? 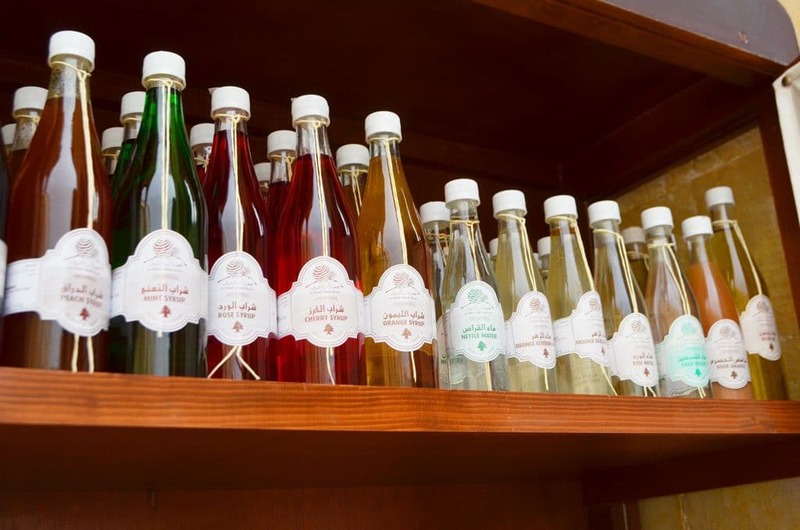 You can see all of our products at Maureen Abood Market!